Johnson, Samuel (1952). Chapman, R. W., ed. The Letters of Samuel Johnson. Oxford: Clarendon Press. Johnson, Samuel (2002). Lynch, Jack, ed. 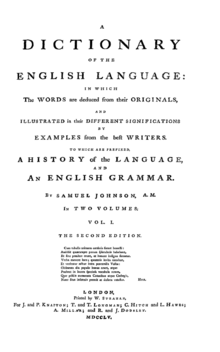 Samuel Johnson's Dictionary: Selections from the 1755 Work that Defined the English Language. Delray Beach, Florida: Levenger Press.